Still in Motion: Interview: Massoud Bakhshi, Director TEHRAN HAS NO MORE POMEGRANATES! Interview: Massoud Bakhshi, Director TEHRAN HAS NO MORE POMEGRANATES! 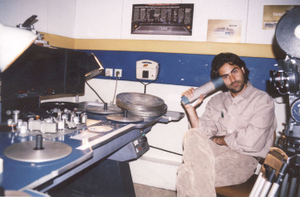 Filmmaker, Massoud Bakhshi, grew up in the city of Tehran, the capital of Iran. Born in 1972, Bakhshi's formative years, unfortunately, collided with a very rough time in his country's history. In September of 1978, demonstrations against the Shah led to riots in this sprawling city at the foot of the Alborz mountain range and martial law was installed in the wake of the ensuing revolution. From 1980 to 1988, Iran and Iraq were at war with one another and the ancient, beautiful city was the recipient of repeated Scud missile attacks and air strikes against random residential and industrial targets, resulting in thousands of civilian casualties. Millions of refugees flooded Tehran and today, the city contains a mix of various ethnic and religious minorities, just like any other large city in the world. Bakhshi spent about seven years making this tour-de-force experimental film, an ironic, imaginative and engaging melange of mixed media, a passionate (and very humorous) ode to his hometown. Tehran Has No More Pomegranates! clips along and, in just a bit over an hour, we are taken on a wild journey at breakneck speed through the sea changes this capital city has experienced throughout its history. The film has played in festivals all over the world and the filmmaker has received many accolades in Iran this past year, including Best Director at the 11th House of Cinema Film Festival, Best Director at the 25th Fajr International Film Festival, the Avini Prize for Best Documentary of the Year (established by the Experimental and Documentary Film Center to commemorate the martyr, Morteza Avini, the writer and documentarian who chronicled the Iran-Iraq war), and the Audience Award at the Cinema Verite International Documentary Film Festival. Still in Motion (SIM) : You’ve made a very rich cinematic piece, something, I think, that will become part of the essential archive about your native city. It's a piece in which you've used all the tools in your arsenal to make one of the most original and innovative films about a city that I’ve seen in a while. At this point, your film has played for Western audiences at various festivals and been very well-received by both spectators and critics. Did you have any presuppositions about how the film would be perceived? Six, seven years is a lot of time to invest in one project. What are your thoughts now that it has exhibited at festivals and is about to go into movie theaters here [Canada] and in the US? Massoud Bakhshi (MB): Honestly, I never really thought of Western audiences at the beginning of this project. 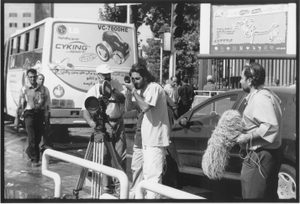 At the beginning, I only had this idea to make a film about Tehran, for the people of Tehran. My directive to myself was to put a mirror up to the people of Tehran to see themselves and the world in which they’re living. If you are from Tehran and you’re living there, you have this advantage to travel to all the big cities around the world. Suddenly, you start to compare your city with these other cities. When you’re living in Tehran, in this time and in this present situation, it’s very important to know in which part of the world you’re living and the importance of that part of the world today. Tehran is the capital of Iran and Iran is located in the heart of the Middle East, which is somehow a very important region in this time in which we’re living. Tehran is also the capital of one of the oldest civilizations in the world. The contradictions, things that are clearly opposing themselves, to me, somehow, are clearly captured in this film. That was the first feeling I had towards this city, its contradictions. Then, there is this language of cinema, the fabulous thing of art, you know? You have to make something for the universal audience, not only for yourself. Generally speaking, art is for human beings, out of the realm of race or nationality. I have a problem with the notion of nationality, honestly. I think that human beings, generally speaking, need to free themselves of all of this nationalism, which is, by the way, a Western notion that came to the East in the 18th century. It’s only been about 200 years that we’ve been talking about “my” country, “your” country. Before, we were living in a bigger world. In the East, what linked us together—someone like me, someone from Turkey, someone from Afghanistan, someone from Turkistan—was the bigger notion of Islam. That’s something really nice, because at the heart of this religion, there is no prejudice or discrimination. The Iranian people accept this way and have done for 1,400 years. 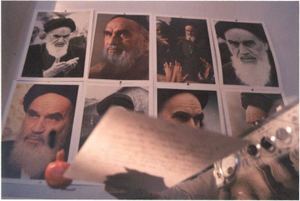 To answer your question, I have to say that from the beginning I wanted to make a film for the Tehrani people. But when I came to the editing stage, I understood that I have to make it in a delicate way, for it to be, somehow, more understandable for a Western audience. SIM: What were your solutions to accomplish that? MB: All of the successful efforts to do this were in the editing. I worked on the edit for more than two years—that’s a long time for a documentary film. I cut it in different steps, making it shorter and shorter, compressing, condensing. But, at the same time, I wanted to keep the heart of the reality of it, the heart of the story in it. The first version was something like 90 minutes, a "feature-length." At the end, I didn’t really care about television or theater, or however it was going to exhibit. SIM: You didn’t let that dictate the length. MB: No. I have problems with this kind of thinking, to cut a film or have it at a length to serve a better distribution ideal. I don’t make films to be sold; I spend anything I have and put seven, eight years of my life into it, so I don’t care if there is somebody that won’t buy the film because it’s too long, too short. It’s the length it should be. So I cut it shorter, to 75 minutes, after about three weeks of very hard work, working with Ali Mohammad Ghasemi, one of the best new filmmakers in Iran right now. I executive produced his first film, which was presented in Venice three years ago, a fabulous film called Writing on the Earth . When we finished his film, we came back to my film, and in three weeks, we accomplished the fine cut. I know for the Western audience right now watching this version, there might be some points or things that they just won’t get, as an Iranian filmgoer would. Things that are easily understandable to an Iranian stem mostly from the sarcasm and the different nuances, the metaphoric theme of the film. But for me, everything I know about American society is through its cinema, its film history. Everything I know about Berlin, I don’t know from having traveled there several times. It’s because I watched and loved and criticized and reviewed, more than I can count, the films about that place—the Golden Era of German cinema. I’ve learned lots of things about history, about sociology, about psychology, about anything, through film. To understand Iranian films and, especially my film, which is very Iranian, people have to study, to do a little work to get closer to the film, the world of the filmmaker, the soul of the film, to understand it. I know that film is considered as an entertainment. But for us, and the difficult world we’re living in, it’s not only entertainment. It offers something much more. Filmmaking for the young filmmakers in Iran is not only about making films; it’s a way of self-expression. This is very important. SIM: That self-expression carries responsibility with it. That’s what I’m hearing you saying. MB: Yes, exactly. I felt really responsible to my generation to show the images of the past and present of Tehran and allow them to compare and to come to personal conclusions, everybody for him- or herself. That’s why I use lots of old footage and present images of modern Tehran together, to provide a visual field to do a quick comparison and, at the same time, to think about this comparison. SIM: I love the still portraits of the people—it’s used to such a good and unique affect, those static shots of the people who live in the city. Those portraits convey a tremendous amount with no “action,” no words. And the amusing way you take these very quick popular polls of what the random members of the population of the city think about certain things is really great. In what profound ways do you think Western audiences would miss something essential that you’re trying to say in the film that would be obvious and easy to understand to an Iranian who lives in Tehran? MB: There are lots of small jokes in the film that might escape people. There's also the music. It’s very nostalgic for the Iranian people; they are living it. That’s the main difference, I think. That’s the soul of the film. Surely, you still get something from the film—you have this chance to know more about the history, the development of the city during different eras, during the Shah’s time, and during the revolution, etc., but Iranians live it. They get something a bit more out of the humor, this sarcastic, self-deprecating tone. There are so many of those cues; we worked really hard on those kinds of details. SIM: Like any good city symphony, it’s an ode, of sorts, to not only the place, but to the population that calls it home. The film is in that tradition. MB: Exactly. For example, at the end of the film, there is this shocking earthquake coming and lots of people in Iran are embarrassed. The film has a humorous, funny tone throughout, but at the end, it gets serious. Reporting the earthquake at the end of the film, we use this funny music and so we’re still joking about the English rats and this kind of stuff. Obviously, this is something serious, but part of the edict was to express it in a funny way, to continue to be funny even in the midst of tragedy. And, you know, that’s the only solution you have when you’re living in such a country. Life is not easy. You have to joke; you have to play with it to make it bearable. It’s not bearable otherwise. You have to make it tolerable. SIM: In your opinion, what is intolerable right now about living in Tehran? MB: It’s intolerable in the sense of urban things. It’s a very urban observation, as well as an environmental one. I think the intolerable things in the film itself we talk about are the pollution, the sewage, urban problems, the disaster of urban “planning” for a big city. SIM: I come from Los Angeles, so I know from botched urban planning! MB: Filmmakers such as Scorsese portray this so well in films about New York, after Robert Moses implemented all these vast changes in service to the development of New York City in the 50s, and before. Something is lost that is more than the identity of the city in this “progress.” New York is obviously getting more and more modern in its development, but something is lost for the people living in those streets of Brooklyn or the different districts of Manhattan. There was kind of a collective identity and collective memory, which is getting lost. There is a neighborhood that one is really attached to and then there’s a highway running through it and so the neighborhood is no more. It’s a destruction of memory. That’s the horrible thing, you know? The old architecture of Iran is the only common thing. When you go downtown, to the center of Tehran, the south part, you still have the memory, the smell of the past. The pomegranate has to be more than a symbol of something—it represents all of the perfumes of the past, the good things about the family, the city, the architecture, human relationships. It’s all getting lost day by day in this modern, mechanical way of life. We call ourselves a modern people living in a modern city but it’s not really true. We’re losing a collective identity. My film passes through certain ages, particular eras with their particular governments in place, but it expresses a more general, visceral feeling of the loss of that collective memory. I can really sympathize with Baudelaire in Fleurs du Mal when he’s talking about his intimate feeling for Paris under its fast development, the creation of these big boulevards, the streetcars starting to bring the food, the crowds in the city. He, as a poet, as an artist, needs to have a more intimate, close, personal and, maybe, private relationship with his city. There have been many works of art coming out of these feelings. It’s probably something very difficult to explain. My film is a simple documentary; I don’t want it to be compared with Baudelaire or the films of Scorsese. But in the whole process in the making of the film, I really seriously studied this idea of modernity and modernization, which are two different things, and sometimes the ideas of these things are misunderstood by people, the people who modernize a country. Especially when the governors or the state directors think that if they modernize a country, things will get better. That was the big mistake of the Shah. He thought he could make Tehran something like Paris or London. The idea of globalization—the idea that everyone has to move in the same direction, or think in the same way. It’s ridiculous. You can’t make, for instance, African people conform and behave in the same way, or have the same attitude towards things, as the American people. It’s the same for Asian people. It’s important to keep things in a particular tradition. There is real suffering about this—things are getting lost. SIM: I think it’s a danger in any society. I come from a place that colonizes with missionary zeal right now in the name of democracy. The idea of going into a place and changing someone’s religion or to change someone’s idea of God or change someone’s relationship with their own spirituality is evil. It may come from good intentions, I suppose, but in essence, more is destroyed than is created. That’s always scared me a bit, that notion, that presumption on the part of one nation in relation to another. I never really saw the point. Have those people’s lives really changed for the better in any way? Have they been enriched in any way? I’m not talking about money, either. Do they even understand what’s going on? I don’t even understand how that happens, to tell you the truth. It’s always been a mystery to me, this notion that someone can convince someone else to just drop their heritage or the idea of who they are and their place in the world like so much excess baggage. References like the ones you make in Pomegranates, come from cinema, from the arts, from music. The politicians aren’t preserving, the governments aren’t preserving anything. You’re out in the world at large, constantly traveling; you’ve lived in different places for a time. For young Iranian, Arab and Afgani filmmakers, that talent that’s coming up right now, what is their stance on all this? Do they feel disenfranchised in any way in terms of where they place themselves in their own society? MB: The hard situations in which they’re living have lots of disadvantages. But they do have the ability to study more about their role in their own lives and to understand the roots of the problems that exist. SIM: How have young Iranians responded to your film? MB: As I said, this is something, somehow, very obvious for them. Here, people may need to study or think about the film, but in Iran it is something really clear and direct and obvious. Telling a joke in Iran by using sarcasm as metaphor is something really normal. If you study Iranian literature, that’s the heart of Iranian art, the sum of Iranian civilization. Anyone in the society, no matter who they are, knows lots of poems by heart, which is not the case in most countries of the world. SIM: Certain places in South America have that tradition of everyone knowing certain poems by heart by their great poet authors. MB: Yes, they have these stories that they know. Reciting a poem by heart and knowing these works, the most difficult and richest lyrics, is normal. For example, Hafiz had this power to inspire Goethe at the age of 63—when he discovered Hafiz, he became like a crazy man! He said that he felt like he was 20-years-old again; he fell in love; he was rejuvenated. Every Iranian puts Hafiz beside the Koran. You can never say this in any other Arab or Muslim country—they never put anything beside Koran. But for Iranians, his poetry is divine. This is our difference. As well, we are the only nation that refused to change the language [Farsi]; we kept the language with lots of sufferance. Every other country in the East, when converting to Islam, adopted Arabic. Not in Iran. For Iranians, this film is exactly the mirror I wanted to put in front of them. They understand that and that’s why they really love the film. They recognize. This is a film, fortunately, that people want to watch over and over and over again—because of the music, because of the structure of the film, the fast way it’s edited. All the films coming out now in Iranian cinema are structured very differently. SIM: It's definitely not like any Iranian movie I've ever seen. The film just floods over you—it plays out almost like a dream. It’s disjointed and zips around here, there, everywhere, but it’s still all of a piece, somehow. MB: It’s very kind of you to compare it to a dream. It’s kind of a re-view of history. We always repeat our historical mistakes. We need to study over and over again our history. 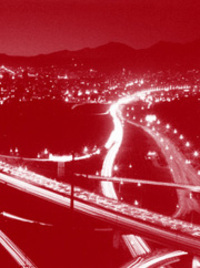 This film reviews, very fast, the history of this city’s past. That’s something we need. MB: Maybe Iranians even more because we have experienced many important and history-making events in only one century. The revolutions of the century—the constitutional revolution in 1901 and the last one in 1979—all these reforms in contemporary history. I remember when I was just 15-years-old, I felt like I was a 50-year-old man. MB: I suppose because from a very early age, we started to know about the problems we had—that life was not as sweet and as easy as it was written in the fairytales. It could be a horrible experience, too. It could be not being able to sleep under the bombardments of Tehran during the course of those years in the 80s [under the Ayatollah Khomeini’s rule during the Iran-Iraq war], to see the images of the martyrs everywhere coming back from the Front. This is when you’re a child. My generation grew up like this. You always have this feeling that life is too short. So I felt an urgency to make something that reflected this. Before making something for the world, I wanted to make something for my own people and do it in the right way. SIM: Listening to you talk, I feel, in an odd way, reverberations of what I feel about my own country, as young as it is. Unlike Iran, it’s a baby--a loud, crying infant that’s prone to temper tantrums; that’s how I see the US right now. When a kid has tantrums, everybody suffers; that’s the whole point of having a tantrum. Even as young as we are though, we took a turn somewhere and now we don’t know where we are. We have a government in place that makes sense to no one. We’ve lost our way. The difference between my culture and yours, I think, is that we don’t have that rich tapestry in which to wrap ourselves, to remember where we came from, that strong touchstone that Iranians have with their own history. MB: But, at the same time, you have this big advantage of these modern values. We shouldn’t forget about this. SIM: What modern values are you talking about specifically? MB: All the fruits of modernity that have been built. Someone has said that America is modernity without subtitles—it’s pure in its modernity, in other words. But you speak of this feeling of feeling responsible, taking responsibility. That’s the main thing we need. American artists, American people, American government in general—you are the biggest country in the world benefiting from the fruits of modernity, benefiting more than any other nation in the world. This is the country of Washington and Lincoln, as you used to say. Make it in a way to deserve this legacy, not to destroy it. You are young, like a kid, compared to these old civilizations. These old civilizations have a kind of dignity. MB: Exactly—they are calm and wise. It seems like when you talk about India, for example, it’s such a beautiful background, the cradle of democracy. In the heart of the culture, especially in India, they have this ability to rely on that history and this gives them a kind of image that’s really dignified. But with American people, it’s just the opposite. So you have to find your role; you have to re-create your image for the modern time. Otherwise, it’s going to be destroyed. History is so cruel. There’s no other way. If you don’t believe in justice and are always thinking of just yourself in a very aggressive way—that’s what the American government does. Look at history—we should never forget the history. Those big empires—the Roman, the British—they are all gone because of this. Becoming the masters of everything, becoming so big. History is so cruel. In a small way, in a personal way, aggressive people lose more, ultimately. You have to be giving. SIM: I think my biggest source of grief in all this is that I know the American people to be very much that way—giving, I mean. But, again this wrong turn, this leadership we have. Having said that, I truly believe that we have the government we deserve. Sadly, that's true. MB: That’s in a very important verse of Koran. It’s fantastic what you said. It’s written in Koran that the fate of every nation rests with its people. The people get what they deserve in direct accordance with how they are, how they act in relation to their own government. It’s a logical idea. SIM: Yes, because due to passivity, due to having so much comfort, we’ve created a nation of drug addicts. By this I mean that as long as the vein is fed with whatever it takes to keep people complacent, we will continue to be distracted by the need to fill this, seemingly, unending need for material wealth. MB: And when it disappears, you feel sicker and more lost than before. So you need more. SIM: It’s really a death sentence. It will kill you, in the end. We see this over and over again in the movies, in a lot of our art. Through our artistic voices, it’s the only way we can keep calling attention to this. There are huge swaths of the population that still are not heard. I like your analogy of using cinema as a mirror held up to your own people, to your own culture, your own society. The best documentary does that—it says, “This is us.” It’s silly, it’s ugly, it’s funny, it’s beautiful. MB: As I listen to you, I think about how essential it is to go far enough back, or get to view things from a high enough angle. You can see more, more of what’s going on in the world, not just the personal problems we are thinking about for ourselves, thinking about tomorrow, my vacation, my car, my house. It’s really heartbreaking to see that the people in the West are in this state. When I was studying in Italy, I would sit with friends there and we would talk about the main differences I saw in Italian life and in Iranian life. I used to answer that, in Iran, we are usually thinking about deeper problems about life and there, they are thinking about buying a new car and where they will go on vacation. SIM: I lived in Italy, too, and have a lot of friends there who are, also, currently so discontented, unhappy, depressed, pessimistic—they suffer from the same “modern” malaise that a lot of us experience. In my world, it’s normal for me, and my friends, to have an existential crisis every five minutes. MB: Something that is really heartbreaking for a young documentary filmmaker still based in Tehran, is that when I come here, I see all these people sitting around watching the TV. And they learn that every day, “30 people were killed in Iraq,” or something like this. They just turn off the television and go have a glass of wine or go about daily life—there is absolutely no impact on a human level. SIM: Yes, it has no real meaning for most people. It has nothing to do with our daily lives at all. Another filmmaker friend, in talking about the same thing, said that there’s no indication in our own country that we’re at war. It’s something that’s happening “out there” somewhere. Our daily lives are not affected or impacted in the least, rarely making any connection between how we're living and people dying in some faraway land. It’s a dangerous road we’re on. Our leaders tell us that if we don’t wage war, our way of life will be destroyed. This is what’s keeping us “safe”—our strength is our wealth, a mass delusion that’s been very effective for a long time. MB: I think through these conversations and through sharing our work, we can continue to remind ourselves of how much we can collaborate on a better future. As I said, we need to keep ourselves aware of the past, and always use that to inform our journey forward.